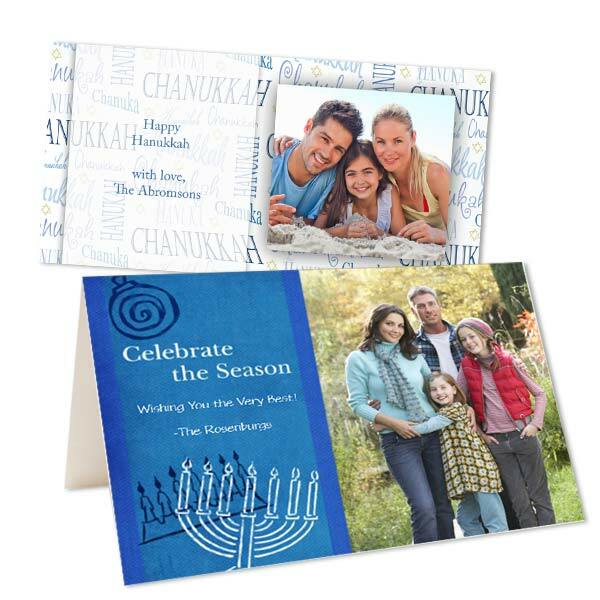 Celebrate the season of light with friends and family and make your own Hanukkah photo cards this year. You can upload photos directly from your phone and choose a Hanukkah greeting card template to feature your digital pictures or even your own artwork. We offer dozens of designer inspired card layout in an array of styles ranging from classic to modern! Custom photo cards are a fun, unique way of sharing your favorite photos with loved ones while spreading joy during the holidays. You can include family portraits, snapshots of the kids, or several random photos saved on your phone from the past year. No matter the card style you choose, they arrive with complimentary envelopes at your door so you can send out your greetings with ease! Speaking of card styles, customer’s love our classic photo paper greeting cards! Printed on silver halide paper, they bring out your photos’ color and clarity for a greeting that makes a statement. Looking for cardstock instead? Our two sided Hanukkah cards are reminiscent of traditional post cards and you can customize the front with photos and artwork, and add your own personalized message on the back. Don’t forget about our folding photo cards for a more formal look! With all of our custom options, the sky’s the limit. For more holiday photo card styles, take a look at photo personalized Christmas cards, New Year’s greetings, and Thanksgiving photo cards for our complete collection!